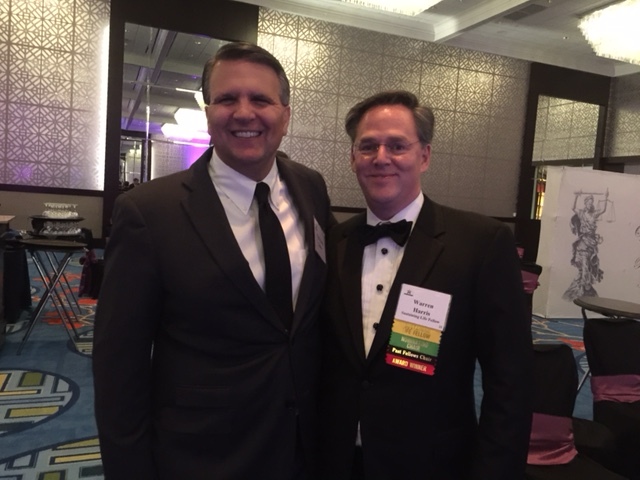 University of Houston Law Center Associate Dean Greg R. Vetter, left, with alumnus Warren W. Harris '88, right, at the Texas Bar Foundation Awards. June 26, 2017 – An alumnus of the University of Houston Law Center received statewide acclaim from the Texas Bar Foundation at its annual dinner Friday in Dallas. Warren W. Harris '88 was the recipient of the Gregory S. Coleman Outstanding Appellate Lawyer Award. The accolade was established in 2001 by Yetter Coleman LLP. The award is given to an attorney who exhibits outstanding appellate practice while maintaining a strong commitment to providing legal services for the underserved and dedication to mentoring young attorneys among other requirements. Harris is a partner at Bracewell's Houston office, where he leads the firm's appellate practice. He has extensive experience in high-stakes appeals locally and nationally. Warren is a Fellow of the American Academy of Appellate Lawyers and is president-elect of the Houston Bar Association. He was a past president of the Texas Supreme Court Historical Society and former chair of the Texas Bar Foundation Fellows. Warren was also chair of the State Bar of Texas Appellate Section, the Houston Bar Association Appellate Practice Section, and the IADC Appellate Practice Committee. From 2009 to 2011, Harris served as president of the University of Houston Law Alumni Association. He has taught as an adjunct professor in appellate advocacy at the Law Center and at the University of Texas School of Law. Before attending the Law Center, Harris completed his undergraduate education at the University of Houston in 1985.